The Renaissance castle Rosenburg not only attracts visitors for its splendid architecture and long history, but also because you can experience different birds of prey close up. 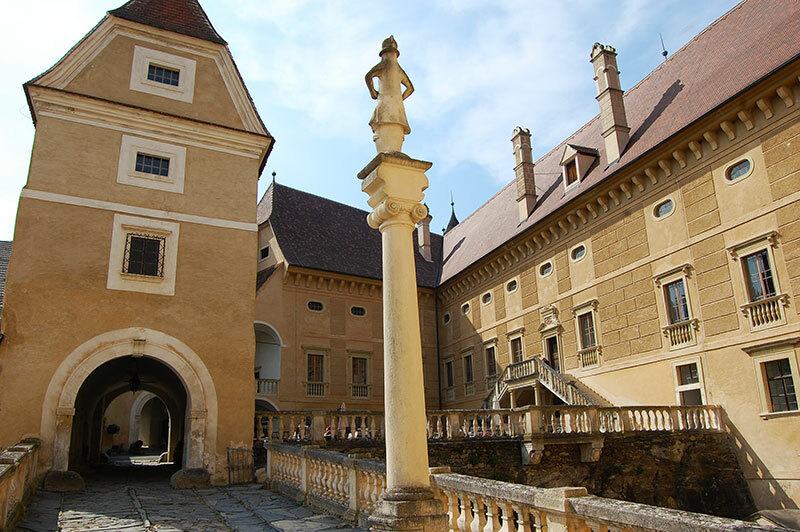 Like so many other castles and palaces in Austria, this place has a fascinating history, a great location and is very well preserved. Hence, you really get a sense of the almost 1000-year history of Rosenburg. 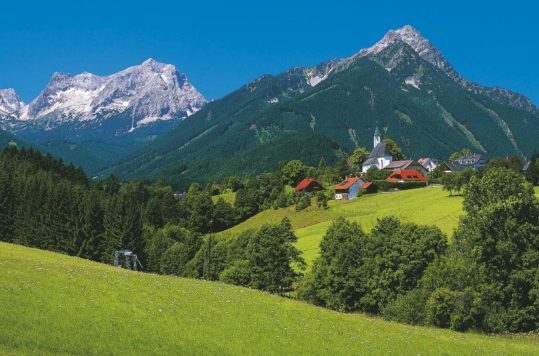 At Rosenburg, they focus on a varied program of activities for their visitors. 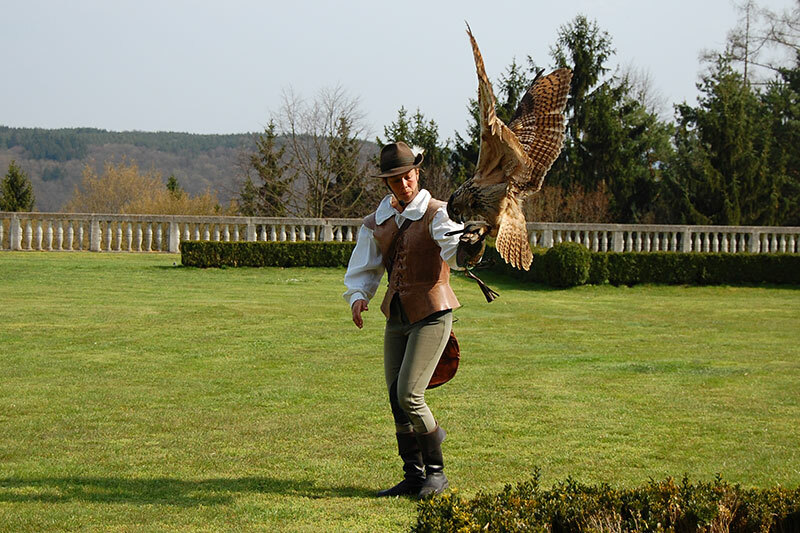 One of the events that makes Rosenburg worth visiting is their birds of prey breading program and falconry show. Hunting with falcons has been a popular pastime among the nobles in Austria for hundreds of years. The masters of the castle of course owned large land areas and hunting grounds where they could, among other things, pursue falconry. 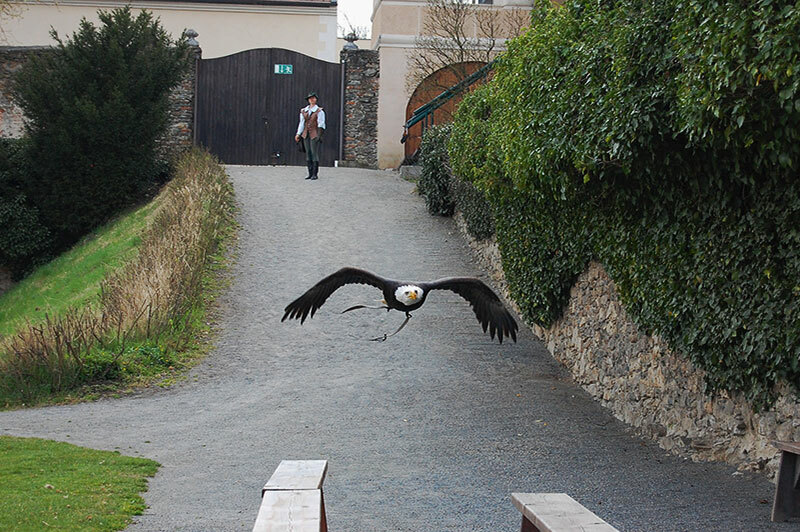 As part of a varied adventure program offered at the Schloss Rosenburg, there are predatory bird shows held throughout the summer. The castle’s grandiose viewing terrace, which is really a large lawn, is a great backdrop for the hour-long show. Not only hunting falcons are displayed at the shows, but also eagles, owls and vultures. The 4-5 professional falconers who hold the show are dressed in costumes from the Renaissance. Rosenburg offer an audience-friendly show where the falconers inform about the birds and explain what happens via a speaker system. Suddenly, large and small birds of prey swept right over our heads. Although I have never really had any particular interest in falconry it was really interesting to see these birds unfold up close. One can of course ask if it is ethical to keep these birds locked in cages, but I got the impression they got a lot of time on their wings. One of the elements of the demonstration is to show how the birds use thermal soaring for their flights. For a while, they disappeared high up into the clouds over the castle before they suddenly came descending after the “prey” the falconer offered them. 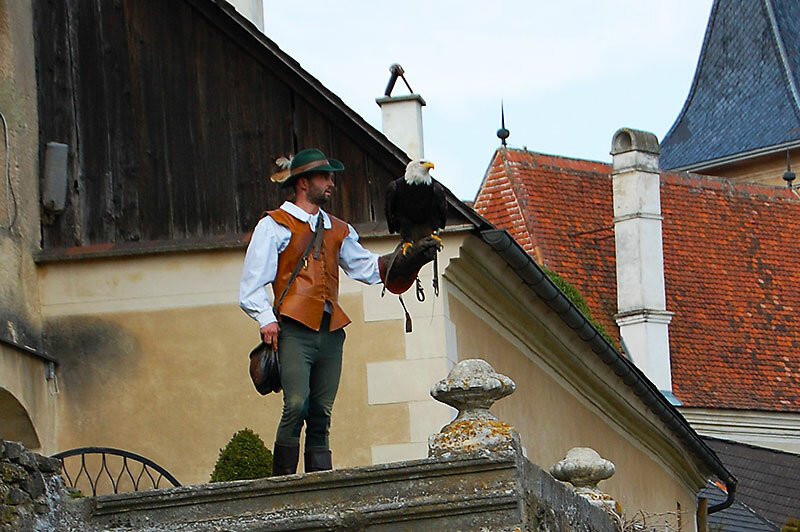 UNESCO declared the tradition of falconry in Austria as “Intangible Cultural Heritage”. Rosenburg is part of an international bird of prey breeding program and works to spread knowledge about birds of prey. 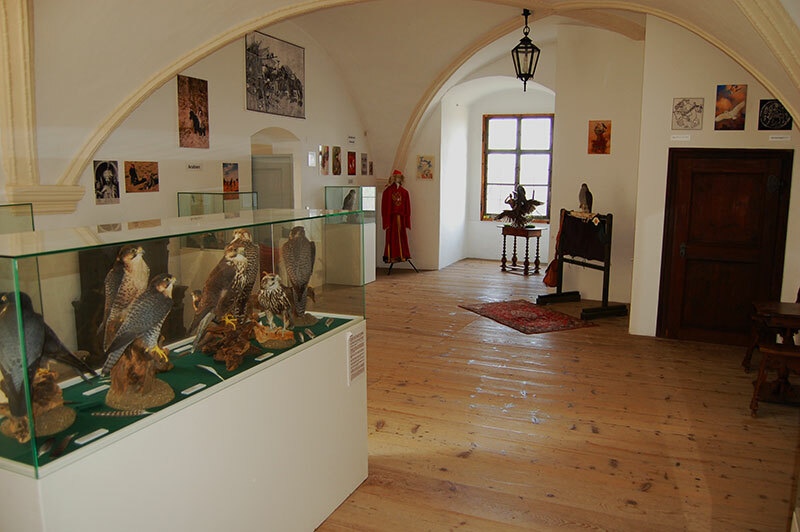 Inside the castle you will find a small falcon hunting museum which is included in your entrance ticket (Basic entry). Everything from stuffed birds, photographs and a host of artefacts tells of falconry traditions from all over the world that go far back in history. A great feature were videos taken by tiny cameras attached to the birds that literally gives you a bird’s eye view of the world. For those interested in historic weapons, Schloss Rosenburg also has a large arms collection. 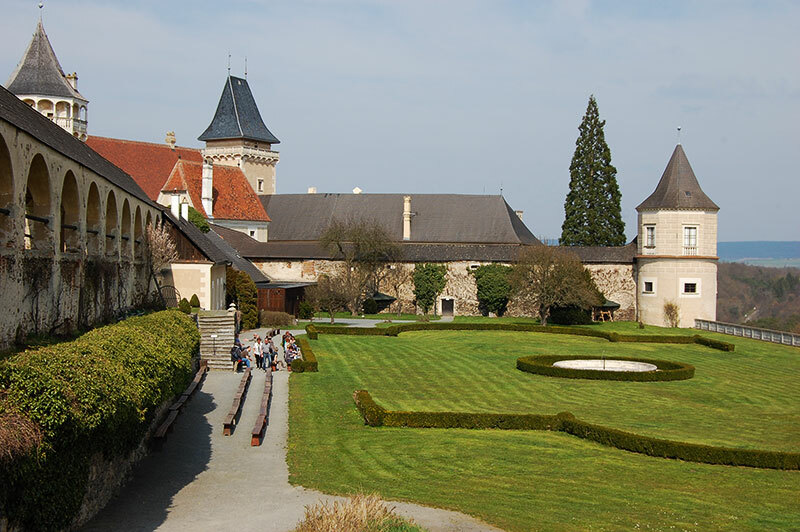 Of course, there is also an exhibition devoted to the Hoyos family who owns the castle, and which displays some of their more than 500 years long history associated with the Schloss Rosenburg. The Renaissance castle is not just about predatory bird watching. The castle itself is a gem and should be explored. One of the best sights outside the castle is the rose garden, and the 120-meter-long rose wall along the tournament square, which when it is at its best in June is an absolutely glorious flower display. Our visit took place in the spring before the flowering had started, but we will be back. During the various seasons there are a number of different events in and around Rosenburg. Historic theme days that take you back to the 17th century, theatre performances, mediaeval Knights’ tournaments and there is always a Christmas market in December. Check the event calendar for more info. The Renaissance castle Rosenburg started its history in 1175 as a pure defence castle or fortress. 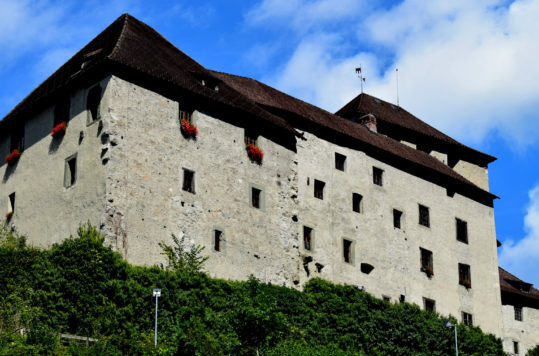 The location on a ridge above the river Kamp in Kamptal, Lower Austria, which is part of the historical core area of Austria, has meant that the castle has been involved in a multitude of wars throughout history. In the 16th century, the castle had lost its strategic value and was rebuilt into a palace. 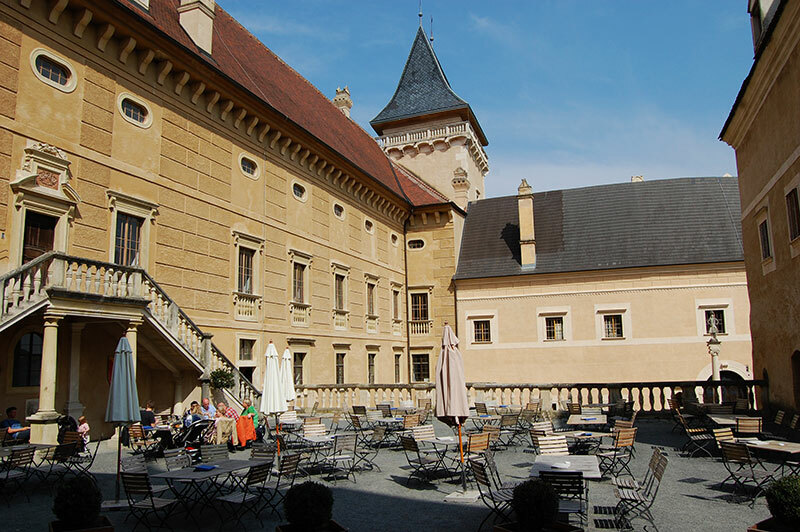 Rosenburg is presently owned by the von Hoyos-Sprinzenstein family who took over the castle in 1681. Several fires destroyed much of the palace in the 17th and 19th centuries, but the palace was extensively renovated between 1859 and 1889 and today appears as a magnificent Renaissance-style castle.